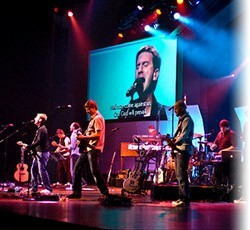 In 2010, North Point Community Church launched North Point Music to bring local worship leaders, musicians, and songwriters together to inspire a generation and influence the church. The Alpharetta, Georgia-based record label and music publishing company is now home to worship leaders/songwriters Eddie Kirkland, Todd Fields, Casey Darnell, and Dove Award winner Seth Condrey. North Point Music has a strong foundation from which to pursue its mission. As an organization, North Point serves more than 30,000 people each Sunday at its five Atlanta-area churches, and thousands more attend its 30 partner churches in the United States and 12 international partners.